Six Howard law students received the Earl H. Davis Award for their dedication to public service. The awards were presented by the Jack and Lovell Olender Foundation in December. Annual C. Clyde Ferguson Lecture to focus on black economic empowerment . National Bar Association President Kevin Judd and other leaders discuss how African American households can close the wealth gap. In partnership with the National Bar Association and the Thurgood Marshall Law School. 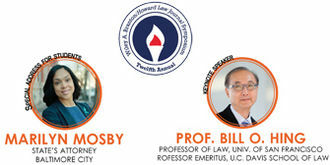 Sponsored by Howard University School of Law, Sidley Austin LLP and Debevoise & Plimpton LLP. Pauline Murray Suite - 7:00 p.m.